We created this guide in collaboration with Deepa Paul, an expat and travel blogger who has been living in Amsterdam since 2011. Deepa served as the local neighborhood expert for this post by selecting the very best areas to stay in Amsterdam. We (Katie & Geoff) added in the hotel recommendations, as well as our own thoughts based on our time spent in Amsterdam. Disclosure: This Where to Stay in Amsterdam Guide contains affiliate links. That means we may earn a small commission when you use the links on this site to book a hotel, buy your travel insurance, etc.. You don’t pay anything extra. If you’d like to learn more about how this works, you can read more under our Disclaimer page. Amsterdam is a compact city, and you’ll be able to walk to many of the places you want to visit. With only 850,000 people sharing 219.3 square kilometers / 84 square miles (just a bit bigger than Brooklyn), it’s very easy to get around. Visitors are often surprised by how easy it is to walk from one neighborhood to another, or even across the city (especially at its narrowest point near Centraal Station). If you want to get around Amsterdam mostly on foot (and have a pleasant time while you’re at it), stay in the Centrum or Jordaan, areas filled with tiny streets rather than large, sprawling blocks. If you’re happy to jump on a tram to have a few more options at your disposal, then choose from any of the seven of Amsterdam’s best areas to stay below! Photo by Javier M. via Unsplash. Used via a Creative Commons Zero License. Centrum: For tourists and short-term visitors, Centrum is the most popular area to stay in Amsterdam: it’s the oldest part of the city, it’s close to everything you’ll want to see, and it’s very walkable. It’s also very touristy. The Jordaan: Pretty, clean and charming, stay in Jordaan if quaint streets and canals, and an eclectic mix of new and cool, sound right up your alley. Canal Belt / Nine Streets: A UNESCO-protected area that has looked almost the same for 400 years, this is possibly the prettiest part of Amsterdam. If you love design hotels, boutique shops and cafés, stay in the Canal Belt / Nine Streets area of Amsterdam. De Pijp: Cool, vibrant and full of shops, cafés, bars, and a great market, De Pijp gives you convenient access to tourist favorites while experiencing a bit of local life. Museum Quarter: The posh museum quarter is home to Amsterdam’s most famous museums, most upscale restaurants and cafés, and the sprawling and tranquil Vondelpark. 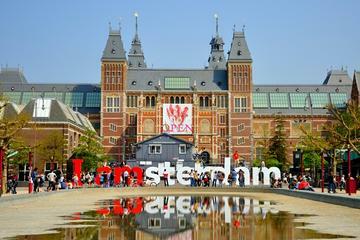 If you’re coming to Amsterdam for high culture or luxury, stay in the Museum Quarter. Oud West: Diverse, residential, and mixed income, stay in Oud West if you’re looking to uncover Amsterdam’s hidden gems like a local. Oost: A residential area popular with young families, Oost is a great place to stay in Amsterdam with kids. With loads of green space and easy access to the centre via trams, Oost has a tranquil-cool feeling. Pick up an Iamsterdam City Pass and get complimentary admission to many of Amsterdam’s top attractions, including unlimited public transportation. Entrance to the Van Gogh Museum, Rembrandthuis Museum, EYE Filmmuseum, Amsterdam Tulip Museum, and over 40 more attractions. It also includes a one hour canal cruise as well as discounts at many other attractions like the Heineken Experience and House of Bols. Available for 24 hours ($61.89US), 48 hours ($72.75US), 72 hours ($83.61US) and 96 hours ($94.47US). For comparison, Van Gogh museum entrance fee is €17 ($18.15US), Rembrandthuis Museum is €13 ($13.90US), a canal cruise is ~€15 ($16US) and a 72 hour transit pass costs €17 ($18.15US). Heading to Berlin Next? Check Out Our Where to Stay in Berlin Guide. Most tourists never make it out of the Centrum, with good reason—it’s where everything you probably want to see is located. You can walk to almost everything without taking the tram or metro. The Centrum is the oldest part of Amsterdam. It’s also where the famous Red Light District (a.k.a. bachelor party central) is located, as well as main shopping drag Kalverstraat. It’s also home to some, in my opinion, pretty soulless places. For example, after almost six years I still grit my teeth if errands take me to the Damrak or Rokin. And I still haven’t figured out why tourists love to congregate at Dam Square. The Centrum is compact and convenient. If you stay here, your experience of Amsterdam will be very much that of a tourist. For two to three days in Amsterdam, it’s a fine choice. If you’re looking for more local character, however, check out one of the other six areas to stay, below! art’otel Amsterdam — A luxury design hotel situated just across from Amsterdam Central Station and within walking distance of the Royal Palace, canals, Jordaan district, and Dam square. The hotel offers an on-site restaurant, access to a Fitness Centre with pool, as well as a beautiful collection of original art works by various artists. Each of the 107 rooms features a unique piece of art, mood lighting, rain showers and a complimentary breakfast. If you are looking for upscale hospitality mixed with an innovative blend of design then this is for you. The hotel has great reviews from its customers and aims for a distinctive atmosphere with the fusion of life and art. INK Hotel Amsterdam (by Sofitel) — This 4-star boutique hotel was formerly the headquarters of newspaper “De Tijd”. Cosy, atypical and with its own courtyard the INK Hotel has been recently awarded as the best design hotel in Holland. It is a five-minute walk from Central Station, situated next to Dam Square. Featuring the “Pressroom”, an intimate bar and restaurant offering a la carte all day and high-end cocktails. The hotel has 149 rooms, including 4 Suites, with each room personalised with their own ‘story’. Hotel V Nesplein — This hotel is extremely well located, half a block from the middle of everything, but tucked away on a quiet street like a little retreat. The trendy, modern rooms and suites come with free Wi-Fi, flat-screen TVs and tea and coffeemaking facilities with floor to ceiling windows which overlook the narrow streets of Amsterdam. Suites add seating areas and Nespresso machines. Additional amenities include an elegant restaurant, a terrace and a cozy library/lounge with a fireplace. NH Collection Amsterdam Grand Hotel Krasnapolsky — Built in 1855, this luxury hotel is a 2-minute walk from the Royal Palace and Its central location on the Dam Square gives you access to all areas of the city. The polished rooms offer free Wi-Fi, flat-screen TVs and minibars, upgraded rooms add sofas, coffeemakers and/or balconies. The onsite restaurant is run by acclaimed chef Jacob Jan Boerma with a great cocktail bar for after dinner drinks. There is a gym with a sauna available to work out and unwind after exploring the city. Hotel CC — Hotel CC is a city center hotel and situated on the Warmoesstraat. Shopping streets and a variety of restaurants, cafes and bars are within easy reach from the hotel. The rooms are cosy but clean and of a modern design. A good option for those on a tighter budget, due to it’s central location there can be some noise. Out of the 81 rooms available we recommend a room on the higher floors with a view of the canal to get the best out of hotel CC. Hotel Library Amsterdam — A 10 minute walk to Centraal Station and right at the top of the Red Light District. In the heart of the city centre but tucked away on a back street for a more peaceful atmosphere. There is complimentary tea, coffee and fruit at reception all day, modern, recently renovated rooms, comfortable beds, iPod docking stations, flat screen TVs and modern bathrooms and showers. Walkable to many attractions, and plenty nearby in terms of restaurants and bars. Photo by Nick Scheerbart via Unsplash. Used via a Creative Commons Zero License. Most often, visiting friends book a hotel in the Centrum. Then I invite them over for a coffee in the Jordaan and they are amazed by the difference—how pretty, clean, and charming it is. The Jordaan is like a village in the city; that global village feel is what Amsterdam is all about. Its small streets, canals, and bridges are a mix of new and cool, and quaint and old-timey. The residents are characters in themselves. Here you’ll find the Anne Frank House, where 13 year-old Anne Frank hid with her family for two years during the Nazi occupation of the Netherlands and wrote her famous diary. Mr. Jordaan — Located at Bloemgracht, an enchanting 17th century canal off of the Prinsengracht slightly off the beaten track. In the heart of the Jordaan, the sassy, smart village in midtown which is upmarket, residential and perfectly safe to wander around in the early hours. A real travellers haven with cosy and welcoming rooms, the hotel is kitschy in a funky, modern way with complimentary tea/coffee and lemon/mint water served all day in the breakfast area. Other amenities are breakfast for a fee, and bike rental. Il Fiore — Located on the first to fifth floor of this beautifully restored building in the heart of Jordaan. Feel at home in this cozy, safe beacon in the picturesque Jordaan district, a quiet, historic neighborhood with all the major hotspots within walking distance. The serene, minimalist rooms with monochromatic decor have free Wi-Fi with breakfast included. There’s a top-floor retro eatery that offers city views, along with a hip rooftop bar and a trendy cafe. An animal friendly hotel with rooms available to include pets and a specialized pet menu available with room service. Amsterdam Wiechmann Hotel — This quaint hotel is family run hotel and started in 1940’s set in 2 townhouses overlooking the Prinsengracht canal. Right on the edge of the old city centre, it is within walking distance of several important museums. The rooms are a decent size, comfortable and include seating areas, desks and free Wi-Fi; some offer canal views. The buffet breakfast is good by continental standards. Amsterdam’s most famous canals—the Singel, Herengracht, Keizersgracht, and Prinsengracht—make up the Grachtengordel, or Canal Belt. Virtually unchanged for over 400 years, the UNESCO-protected Canal Belt is elegant, postcard perfect Amsterdam. The Nine Streets— the cross streets between the canals—are filled with boutiques, restaurants, and cafes that are fun to explore. Some of the best shopping and design hotels in Amsterdam are located here. If you want to explore smaller, more interesting museums, stay in the Canal Belt and Nine Streets. Here you’ll find canal house museums (like Het Grachtenhuis), two amazing photography museums (FOAM and Huis Marseille), and more. Andaz Amsterdam Prinsengracht – A Hyatt Hotel — A five-star boutique hotel in Amsterdam’s historic city center, within a quick walk of the Nine Streets and close to area attractions such as the Anne Frank House and Van Gogh Museum. Complimentary bikes available for guests. Previously a public library building overlooking the Prinsengracht designed by Marcel Wanders based of traditional Dutch art and culture. Stroll through the romantic garden, enjoy the locally inspired Bluespoon Restaurant with an open show kitchen, relax in the Observatorium where the history of Dutch seafaring is retold. It has a modern art theme with 40 video art pieces. There are 122 modern rooms to choose from. Hotel Sebastians — Directly on the Keizersgracht canal in the heart of Amsterdam, a contemporary three-star hotel with a unique and sophisticated design and atmosphere. The location alone is worth the stay: a stone’s throw from the Jordaan district and Haarlemmerstraat but far enough out of the town centre to be relaxed. The hotel bar also boasts a unique and charming atmosphere. Featuring colorful or dramatic decor, the plush rooms range from cozy to airy. Buffet-style breakfast is complimentary and the onsite jazzy bar serves lunches and snacks. ‘t Hotel — This small, quaint, boutique style hotel was a historic canal house. The ‘t Hotel is a small family-owned hotel, located a few minutes of the Dam Square, but hidden from the crowded rush of city life by canals. The 8 sophisticated, colorful rooms feature elegant decor and stylish furnishings and all rooms overlook the canal or the garden with breakfast included. The building overlooks the ‘Leliegracht’ canal where trees filter the sunlight during the day and at night lanterns create a peaceful and romantic atmosphere. Dikker en Thijs Fenice Hotel — Set in a redbrick building beside Prinsengracht canal the hotel is located right along the Prinsengracht Canal, in the heart of Amsterdam’s charming city center, close to the Leidse Square. The warm, traditionally furnished rooms and suites feature free Wi-Fi and flat-screen TVs. Upgraded rooms and suites add canal views, sitting areas and/or original wood-beamed ceilings. Amenities include a breakfast buffet (fee), a modern lounge with exposed wooden beams, and features a French cuisine with international influences and uses of seasonal ingredients. Open daily for lunch or dinner. There’s also a gym and an art gallery. Hampshire Hotel – Rembrandt Square Amsterdam –This upscale hotel in a redbrick building is situated in the Rembrandt Square area of Amsterdam near the Ballet and Opera hall. The hotel is located at the rear of the Eden Hotel a simple walk through the ground floor foyer area solves that riddle. The modern rooms also have free Wi-Fi, minibars, and tea and coffeemakers with room service available. Continental breakfast is available (fee). There’s also a traditional Parisian-style brasserie and a cozy, sleek piano bar/lounge. Here you can enjoy an exquisite lunch or dinner in an authentic French atmosphere. Other amenities include meeting rooms, bikes rental and parking (fee). Below the eastern side of the Canal Belt is De Pijp (“the pipe”). De Pijp is a cool, vibrant neighborhood densely packed with hip shops, cafés, bars, brunch spots, and restaurants near the small, charming Sarphatipark. At the Albert Cuypmarkt street market in De Pijp, you can try Dutch specialties like raw herring and freshly made stroopwafels, while locals shop for fresh produce and flowers. De Pijp is a short walk or tram ride to Museumplein. If you stay in De Pijp, you’ll get have easy access to tourist favorites without living in a touristy environment. Hotel Okura Amsterdam — A five-star, luxury, 23-story hotel overlooks romantic streets running along Amsterdam’s canals. Enjoy Japanese and international cuisine at one of the hotel’s four restaurants awarded by Michelin. The bright, refined rooms have free Wi-Fi and room service. Amenities include multiple dining options, a stylish cocktail lounge and a casual lobby bar. There’s also an indoor pool, a fitness center and a chic spa with massage and beauty treatments. Sir Albert Hotel – This boutique hotel is located in De Pijp, the Latin Quarter of Amsterdam. 90 guest rooms and suites, all created by international award-winning designers BK Architecture. Features IZAKAYA, Asian Kitchen & Bar where you can enjoy this unique example of Asian food culture, and take in views of the canals from the terrace. Ollies Bed and Breakfast – A small boutique bed and breakfast in the middle of Amsterdam providing a homely and very hospitable touch for your stay. All rooms are elegantly decorated with a private bathroom and free wifi. With a homemade breakfast brought to your door in a basket each morning. As the name suggests, the Museum Kwartier is where Amsterdam’s most famous museums—the Rijksmuseum, Stedelijk, and Van Gogh Museum—are located. Mostly populated by posh apartments, hotels, and expensive restaurants, Museum Quarter may not be the coolest neighborhood. Nearby de Pijp has so much more to offer in terms of restaurants, cafes and bars. That said, Museum Quarter in the middle of everything. It offers easy access to other cool neighborhoods without the chaos of the Centrum. Aside from Museumplein, it has Vondelpark, Amsterdam’s version of New York’s Central Park. There’s also Amsterdam’s upscale designer shopping street, P.C. Hooftstraat. If you want museums practically on your doorstep, go for it. And if you’re a bit picky, comfort- and convenience-oriented, with money to burn, then the Museum Quarter is for you. Conservatorium Hotel — This luxury hotel selected by Condé Nast as the finest luxury hotel in Holland. The Conservatorium is an architectural masterpiece, a wonderful atrium that was the heart of the hotel. Combining a landmark heritage building with graceful, contemporary design. In this vibrant and elegant setting, the city’s crown jewels are literally at your doorstep. The spacious, light-filled guest rooms and suites have Art Nouveau interiors by designer Piero Lissoni. The College Hotel – Housed in a stylish 19th-century building, which started life as a school in 1895, just outside the city centre. A training college the hotel and restaurant continue to contribute to the development hoteliers today. The four star College Hotel comprises 40 stylishly decorated rooms, five halls, a lounge and bar, a sunny terrace, and a ballroom. The hotel received the Prix Villegiature for stylish interior decoration. Hilton Amsterdam – Famous for John Lennon and Yoko Ono’s 1969 ‘bed-in for peace’ and Hilton’s first hotel in the Netherlands. Located on a pretty canal in a quiet neighborhood with plenty of places to have quiet walks among pretty gardens and great architecture. The selection of rooms and suites have great views overlooking the canals, large bathrooms and all modern conveniences. Hotel JL No76 — Immersed in Amsterdam’s fashion & museum district, it offers a great location to explore the city. This boutique hotel has a warm, inviting vibe. The decor has sophisticated neutral tones offset with unexpected explosions of colour and an eclectic art collection. Each of its 39 rooms boasts all mod-cons and bespoke wallpaper designed by renowned Dutch artist Barbara Broekman. A bar and restaurant are provided on site with an expansive but intimate feel. Hotel Roemer – The hotel in an 18th-century townhouse is in a quiet location only a few minutes walk from the Van Gogh and Rijks museums. Features are the boardroom, the gorgeous lounge and the sophisticated city garden. A distinctive hotel with 37 rooms & suites is the epitome of peace and tranquility. An intriguing contemporary art collection will leave few unmoved. Hotel Espresso – Opened in October 2012 this is a modern hotel providing 68 comfortable rooms, a foyer with a sitting area and a multi-purpose breakfast room. A quaint, clean, friendly place with no frills which includes free wifi and a 24/7 coffee machine. The old city centre, the canals and the famous museums are all within a few minutes’ walking distance. Now we’re getting real. Oud West is more residential than Centrum, more mixed-income than the Canal Belt, and less commercial than the Nine Streets. It’s more diverse, too, a gateway to truly multicultural neighborhoods De Baarsjes and Bos en Lommer. You can also access Vondelpark from the Oud West, via its main artery, the Overtoom. Oud West is home to De Hallen, a former tramshed repurposed into a cool complex with a cinema, restaurants, boutique hotel, local goods market, and De Foodhallen, a hip indoor food market. If someone told me they were staying in Oud West, I’d look at them with admiration. I’d say they were really serious about living like a local, and will be rewarded by some real gems. Hotel De Hallen — Hotel De Hallen is situated in a former tram depot dating from 1902, blue steel and rusty highlights create an inspiring backdrop. With spacious surroundings with an abundance of plants and a contemporary art collection. This 55-room hotel with an industrial look and feel has a beautiful lobby, bar, terrace, and adjoining restaurant Remise47. The contemporary rooms and suites feature free Wi-Fi, room service and breakfast is included. The hotel is part of the 2,700-square-metre De Hallen complex which also features a library, cinema, boutiques and an indoor food market – all on its doorstep. Conscious Hotel — Conscious boutique hotel offers stylish contemporary interiors with a conservation focus. Based 4 minutes from Vondelpark, this modern, eco-chic hotel offers a casual bar, an Eco roof, a hive for wild bees and locally brewed beer. The bright rooms with colorful, contemporary decor feature free Wi-Fi and flat-screen TVs. Breakfast is offered for a fee in a hip, airy lobby with a relaxed dining area and a vertical garden. Hotel Mosaic City Centre — This modern, glass-fronted hotel is located in the city center. The stylish, contemporary rooms have wifi and floor-to-ceiling windows that offer city views. There is also a sophisticated roof-top terrace with upholstered furnishings that offers panoramic city views to drink in all Amsterdam has to offer. Traveling with kids? Then check out the Oost (East), a residential neighborhood popular with young local families. It’s near the Artis Royal Zoo, which is heaven for little ones, and is filled with playgrounds and parks. The Oost is also hip and up-and-coming, with cool cafes and restaurants along the Javastraat and Javaplein. This is also the only neighborhood where you’ll find a craft brewery right next to a windmill (Brouwerij ‘t IJ). And the nearby Dappermarkt is one of Amsterdam’s most ethnically diverse and affordable street markets. Best of all, you’re never too far away from tourist favorites, as trams 3, 7, 10 and 14 offer easy access to the center. Breitner House — Breitner house is an elegant and refined boutique hotel in the centre of Amsterdam Initially constructed in 1882. Famous impressionists such as George Breitner and Isaac Israels spent their days painting in its spacious rooms. Enjoy the lavish treatment the owners have to offer, including a luxurious champagne breakfast in the classic dining room with a view on the park. A stay at the Breitner House is a unique opportunity to experience the splendour of Amsterdam whilst enjoying the treatment of one of its best hotels. Hampshire Hotel – The Manor — The Hampshire Hotel – The Manor Amsterdam is situated in a unique building in Amsterdam-Oost: the former Burgerziekenhuis (hospital). A trendy hotel with a great relaxed lounge bar next to it’s in-house Italian restaurant, Enoteca. Which provides a wonderful terrace to plan your Amsterdam excisions. A beautiful hotel with spacious rooms that is comfortable, clean and cosy. Hotel Arena — Hotel Arena is located next to the Oosterpark, which is now the natural entrance to the hotel, in a rather quiet area of the city. Perfect, if you don’t want to be too far from the city center (walking distance), but still like it quiet in the evenings. It has 4 star and 119 rooms. It is a monumental building dating from 1886 with high ceiling which give an antique look and feel, but with modern facilities. It has been thoroughly renovated and expanded recently. There is a whole new wing added with studios and the Patio is more beautiful than ever. There is also an original, restored chapel, complete with stained glass windows. Skip the Line: Van Gogh Museum and Rijksmuseum Tour Including Amsterdam Canal Cruise and Lunch is an ‘all encompassing’ tour combining the very best of Amsterdam. This is a 7.5 hour tour that gives you guided tours with an art historian to both Van Gogh and Rijksmuseum, a light lunch, and a 75 minute canal cruise. 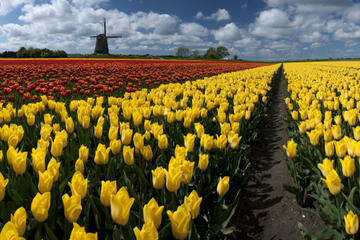 Dutch Windmills and Countryside Day Trip from Amsterdam Including Cheese Tasting in Edam takes you to the Dutch countryside villages of Volendam, Marken, Zaanse Schans and Edam. You will see wooden shoe making, taste cheese, coffee and pastries, see one of the country’s largest churches and, of course, windmills! 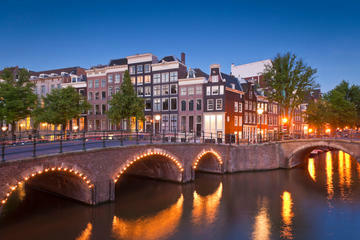 Amsterdam Canals Cruise with Freshly Prepared 4-Course Dinner is one of the most well liked tours in Amsterdam. A cruise through Amsterdam’s canals while enjoying a four course meal, prepared with meat, fish or vegetarian, beer, wine or soft drinks from the bar, while watching one of the world’s most beautiful cities pass by your window. 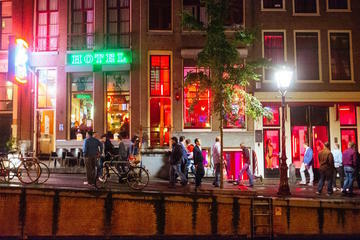 Offbeat Amsterdam Red Light District Nighttime Walking Tour with a Local Guide will answer all the questions you didn’t want to ask, and take you to areas you may not have otherwise ventured. Go with a small group and a local and knowledgeable guide and learn about how the Red Light District and the Coffee Shop culture came to be. Getting from Amsterdam’s Schiphol Airport is quite easy. Direct trains run every 10 minutes to central station from platforms 1 and 2 right at the airport. After you have collected your bags, follow the signs that say ‘trains to city’ and you’ll come across escalators that go down to the platforms. Just before you go down there are many ticket vending machines (don’t worry, English in an option on the touch screens), the instructions are quite easy to follow and you can use a chip & pin credit card. Currently, tickets are €4.20 + €1.00 for the disposable ticket, each, for a single journey and it takes about 15 minutes. Once you’ve purchased your tickets, activate it by scanning the ticket over the scanners before you head down. You’ll see lots of people doing this, not to worry, and do the same when you exit. The process is quite efficient but perhaps not after a long flight, if you’re worried you can buy your tickets online and print out your tickets before you arrive. Click here to go to the train booking page. In the land of bicycles, you might be wondering: should you explore Amsterdam by bike? Let me very gently put down your fantasies: unless you’re an experienced city cyclist, I generally wouldn’t recommend biking in central Amsterdam. Sorry. Bike infrastructure is more developed in Amsterdam than elsewhere in the world, but be aware that you will be trying to navigate an unfamiliar city while jostling with cars, buses, trams, pedestrians, and other cyclists. And it’s the cyclists you really have to watch out for: Amsterdam is home to some of the fastest, most aggressive cyclists in the Netherlands, maybe the world. Even Dutchies from other parts of the Netherlands can get stressed out by cycling in Amsterdam. If you do decide to go for it, know that navigating Amsterdam by bike won’t be all tulips and rainbows. Signal clearly, expect to be cut off by locals, and don’t use your phone while biking, especially in the center. Put that GoPro and selfie stick away. You can enjoy a bike ride through the Vondelpark or in less central areas like De Pijp. You can also opt for a bike tour with a guide who can navigate you through town safely. Trams in Amsterdam are fairly reliable and frequent. Most originate from and terminate at Centraal Station. Tramlines 1, 2, 5 are the most frequently used by tourists. You can buy 1-hour, 24-hour, and 48-hour tickets from the driver onboard any tram. The metro is generally for traveling to areas outside the ring, like to a football game at the Ajax Arena or a concert at the Ziggo Dome. Note from Geoff: As Deepa pointed out, you can buy tickets on board. When the tram arrives, you can only board at the very front, or at the back door, the other doors are exit only. Get on at the back and there will be an employee behind a glass booth where you can buy your tickets, pretty great No more worrying about having tickets, or buying from the machines! So Where Should You Stay in Amsterdam? If I had friends coming to stay in Amsterdam for only a few days, I’d tell them to stay in the Jordaan (so charming), de Pijp (so cool), and as a distant third, the Centrum (so convenient). Couples will love the Canal Belt and Nine Streets (so romantic), while young families will enjoy the Jordaan, Oud West, or Oost (lots of parks, markets, and playgrounds). If you’re traveling with someone picky and kind of upscale in their preferences, perhaps with older relatives, the Museum Quarter is a safe bet. I hope this helps! If you have questions about where to stay in Amsterdam, pop us a comment below or send us a tweet! When I first moved to Amsterdam, I didn’t know much about it beyond the tourist center and its famous Canal Belt. But after living here for almost six years, I’ve come to know Amsterdam and its neighborhoods in and out. I give all my guests the same answers you’ll read here. So far, I haven’t let anyone down and everyone leaves happy! Our series of neighborhood guides all started back in 2015 with our Prague Guide. We published the guide first without hotel recommendations, just as a general tool to help people plan their trip, but we then started getting emails from readers asking for hotel ideas in the neighborhoods we suggested. Where you stay in a city can really make or break your experience. Obviously, we can’t stay in all the hotels we list, and we hire local experts to write about the different neighborhoods in each city, but our experts mostly live in apartments, not hotels. Even so, some readers still wanted help in choosing hotels in each neighborhood, so we dug in and began some (exhaustive) research into the different hotel options in each neighborhood. We look at things like: Does it look to be in a safe and fun area? Will it be convenient to get around and see the sites from this hotel? Does it get outstanding reviews from previous guests? Would I suggest it to my own friends and family? Ultimately, our aim is to take the strain out of deciding where to stay in Amsterdam (the best area), and which hotel to stay in that neighborhood, by doing most of the heavy lifting for you. The neighborhood details are provided by a local expert, and the hotel listings are based on our research, not personal experience. Hopefully our Where to Stay in Amsterdam guide will help you start your trip to Amsterdam on a good note, and stress-free…but please don’t blame us if it doesn’t. We are providing some of the research, and we expect you’ll do some research too to ensure the information hasn’t changed since this guide was published, conditions in the city haven’t changed, etc. Click here to see all of our FREE city guides! Stayed at the Pulitzer a few years back (when it was an SPG Luxury Collection Property – though it appears to have dropped off!) – loved my stay – the breakfast was fantastic and the hotel was very unique. I rented an apartment in the Oud West area 2 years ago on my first trip to Amsterdam. I can fully support that the neighborhood is great! I felt completely safe as a 45+ female traveling alone and ‘living like a local.’ The tram was very convenient and it was away from the noise and hustle of the main tourist areas. Lots of neighborhood bars and restaurants to choose from when I didn’t want to cook. Awesome to hear! We were stayed just beyond Oud West over Christmas, in Oud Zuid, and I agree with you :) Thanks for weighing in and helping future visitors figure out the best place to stay in Amsterdam for them!